Harmonica ensemble “Animato” was founded in 1978 by Jerzy Grzesiukiewicz and is the longest acting chamber ensemble in Szczecin. 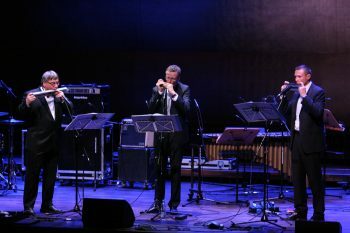 Marek Jaroszyński (playing on chromatic), Piotr Bieliński (chord), Piotr Włodarczyk (bass) are harmonica enthusiasts, graduates of accordion and piano class of music school playing together since 1992. “Animato” is the unique group with a rich artistic achievements which is a regular guest of Polish and European music festivals. They are active in Poland and abroad, giving dozens of concerts a year. 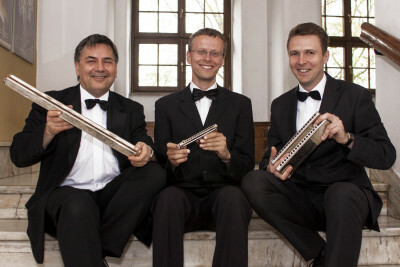 In addition to awards and honors gained at Polish festivals, “Animato” finished twice on the podium of international harmonica competitions, including won the prestigious World Harmonica Festival in Trossingen (Germany). Members of the group serve on jury of the Polish and international harmonica competitions. Over the many years of activity they have performed in prestigious concert halls and philharmonics in Poland and abroad presenting a wide technical capabilities and qualities of orchestral sound of concert harmonicas. The ensemble have in the repertoire its own arrangements of different kinds of music including popular works of classical music, jazz and swing standards, Polish and international hits of light music as well as shanties and folk music from all over the world. They recorded 3 CDs with a diverse music including the latest album entitled “animato in classic”.